The Second Revision (so indicated on the title page) was produced in a variety of formats from octavo to 18mo to 32mo. 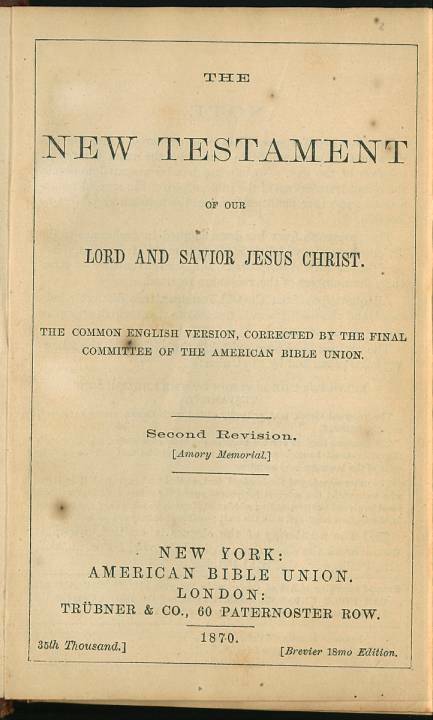 The editions prepared by the American Bible Union seem to be of two "memorial" editions. The earlier Testaments are "Amory Memorial" and the later editions are "Merrill Memorial" (I am unsure when the change took place). These ABU editions also seem to come in three sizes: octavo, 18mo, and 32mo. 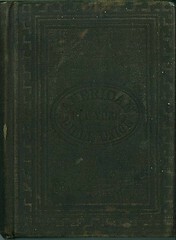 The first edition of 1865 was published in an octavo. The 18mo size is copyright 1865 while the 32mo is copyright 1866 even though I have not been able to find any differences between the two except the size. 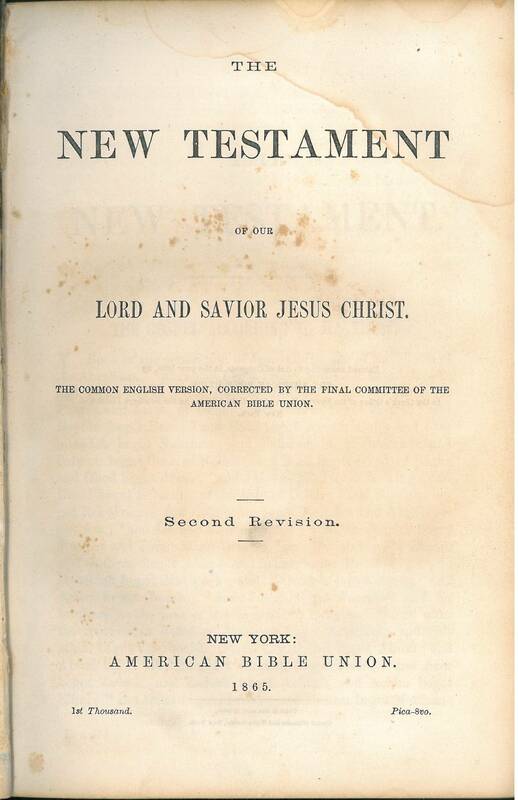 In 1883 the printing and distribution of this version was taken over by the American Baptist Publication Society. So, any edition containing their imprint was probably produced after 1883. 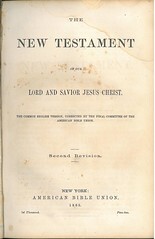 This edition is seen in an octavo but the text is still copyright 1865 and appears identical to the editions published by the American Bible Union. 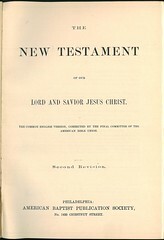 In 1955, B. C. Goodpasture published an "exact reprint" on the "Second Revision" - this was the last know publication of an American Bible Union Testament until recent "print-on-demand" editions. Like the "First Revision," this version was also prepared by Thomas J. Conant, Horatio B. Hackett, and Asahel C. Kendrick. Title: The New Testament of our Lord and Savior Jesus Christ. 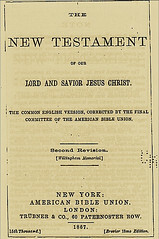 The Common English Version, Corrected by the Final Committee of the American Bible Union. Second Revision. New York: American Bible Union. 1865. 1st Thousand. Pica-8vo. References: Chamberlin 556-1; Herbert see 1962; Hills 1791 (see also 1804), Taliaferro-EELBV 7475.130. Title: The New Testament of our Lord and Savior Jesus Christ. 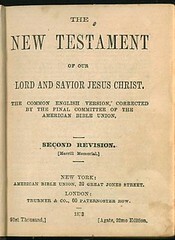 The Common English Version, Corrected by the Final Committee of the American Bible Union. Second Revision. [Amory Memorial] New York: American Bible Union. London: Trübner and Co., 60 Paternoster Row. 1866. 10th Thousand.] [Agate, 32mo. Edition. Title: The New Testament of our Lord and Savior Jesus Christ. 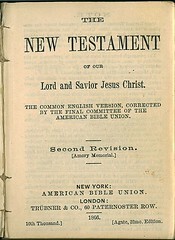 The Common English Version, Corrected by the Final Committee of the American Bible Union. Second Revision. [Amory Memorial] New York: American Bible Union. London: Trübner and Co., 60 Paternoster Row. 1870 35th Thousand] [Brevier 18mo Edition. References: Chamberlin 556-1; Herbert 1946; Hills 1863, Taliaferro-EELBV 7475.130. Title: The New Testament of our Lord and Savior Jesus Christ. 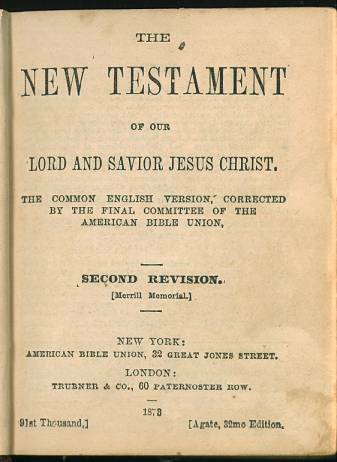 The Common English Version, Corrected by the Final Committee of the American Bible Union. Second Revision. 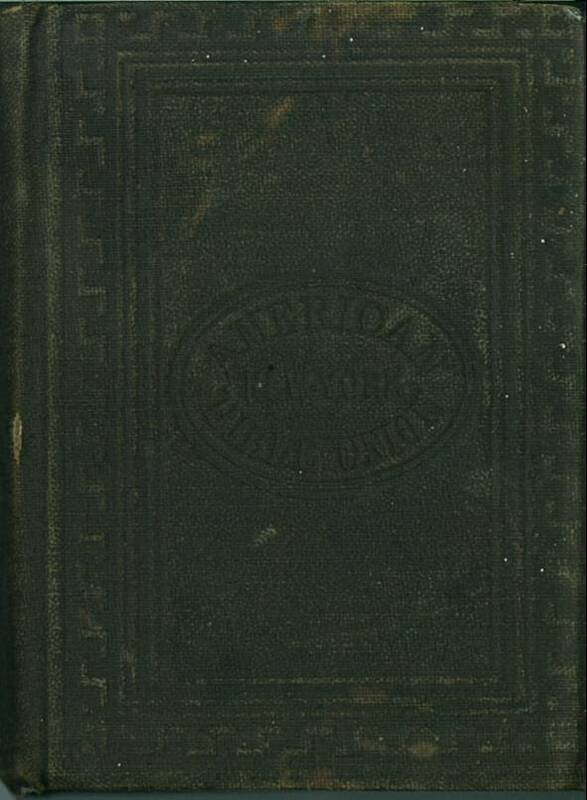 [Merrill Memorial] New York: American Bible Union, No. 32 Great Jones Street. London: Trubner and Co., 60 Paternoster Row. 1873 91st Thousand,] [Agate, 32mo Edition. Title: The New Testament of our Lord and Savior Jesus Christ. / The Common English Version, Corrected by the Final Committee of the American Bible Union. / Second Revision. [Willingham Memorial.] 15th Thousand.] [Brevier 18mo Edition. Comments: Paperback octavo, adhesive binding. 490 pp. 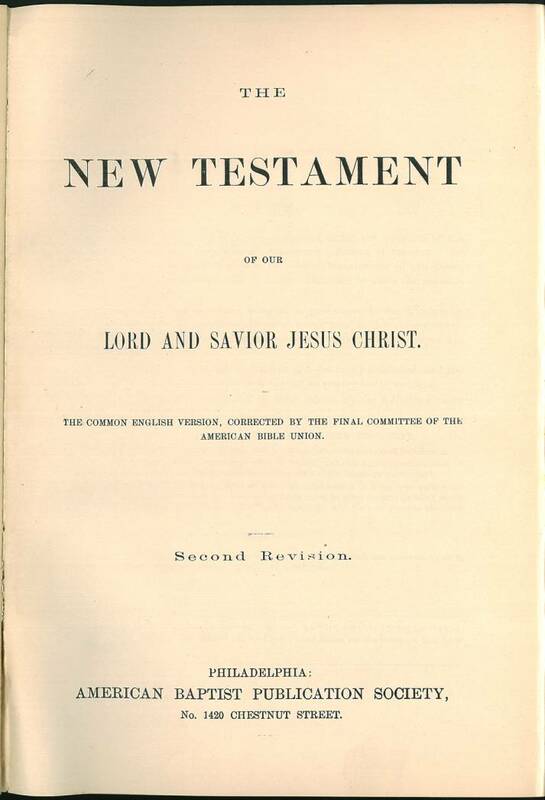 General remarks and information about this NT (1865 ed.) are given in an undated introductory NOTE. The scripture text is printed in running form and single column except quotations from the Old Testament, which are set with spaced letters or in colometric print. Chapter and verse- numbering inside text. The Old Testament citations are not specified. Brief remarks and alternate readings are located in footnotes as are verses not found in other “ancient“ copies, e.g. the Textus receptus. This leads to the conclusion, that a critical Greek text has been used, although not specified. Information about omitted verses from later copies of the Byzantine text group are mentioned also in the footnote, e. g. Mat. 6:13b or the “comma Iohanneum“ in 1 John 5:8. Title: The New Testament of our Lord and Savior Jesus Christ. 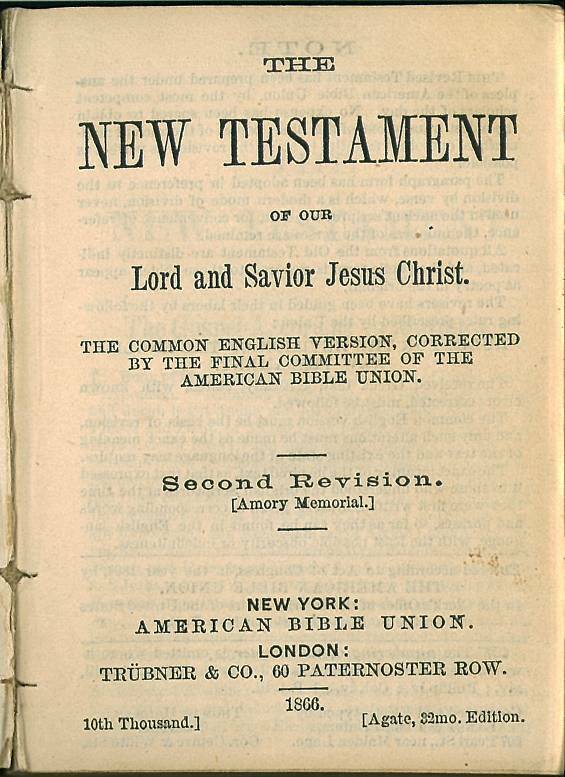 The Common English Version, Corrected by the Final Committee of the American Bible Union. Second Revision. Philadelphia: American Baptist Publication Society, No. 1420 Chestnut Street. References: Chamberlin 556-1; Herbert 1946; Hills 1791, Taliaferro-EELBV 7475.130. 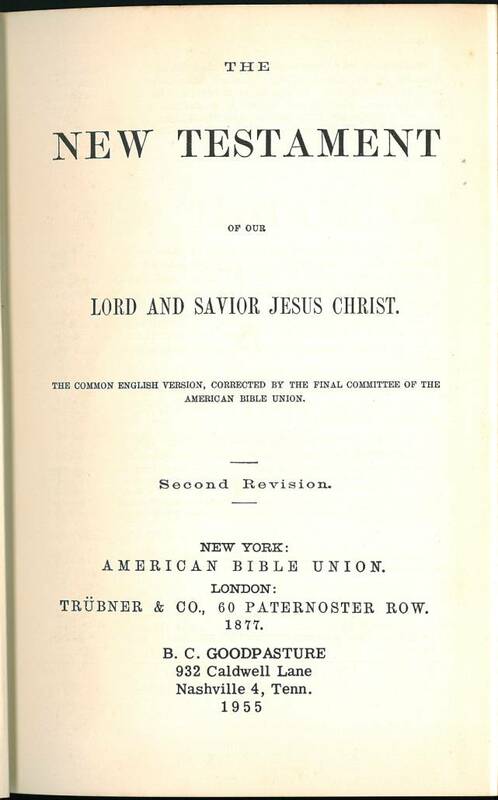 Comments: Since this was published by the American Baptist Publication Society, it is likely a later edition (after 1883). Title: The New Testament of Our Lord and Savior Jesus Christ. 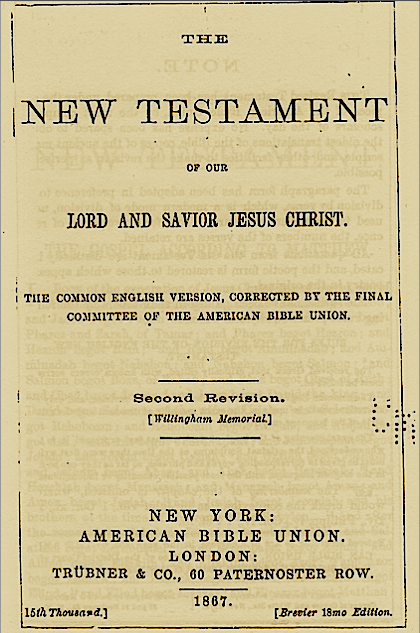 The Common English Version, Corrected by the Final Committee of the American Bible Union. Second Revision. New York: American Bible Union. London: Trübner & Co., 60 Paternoster Row. 1877. B. C. Goodpasture 932 Caldwell Lane Nashville 4, Tenn. 1955. Comments: The last known printing of an American Bible Union Testament before recent "print-on-demand" facsimile editions.